Whether they live in owner-occupied homes or rental housing, children are often invisible victims of the foreclosure crisis. Mortgage records do not show how many children are living in a house, and information about children in multifamily housing units under foreclosure is even harder to come by. In a policy brief I wrote shortly before joining the Urban Institute, I combined Census Bureau data on children’s living arrangements with foreclosure estimates from the Center on Responsible Lending to get a rough sense of how many children are affected by the foreclosure crisis. The answer may be higher than you would think. An estimated 8 million American children, or more than one in 10 kids, have been or will be affected by the nation's foreclosure crisis, according to my estimates. The national estimate includes 5.3 million children in owner-occupied homes with an additional 3 million children in rental housing. The number in rental units is too rough to break out by state, but a map of children in owner-occupied homes shows striking differences across the country (see map below). In Nevada, almost 1 in 5 children (19 percent) lived or live in owner-occupied homes that were lost to foreclosure or are at risk of being lost, much more than the 7 percent nationwide. The numbers are also quite high, 10 percent or higher, in Florida, Arizona, California, and Michigan—other states hit hard by the housing crisis. 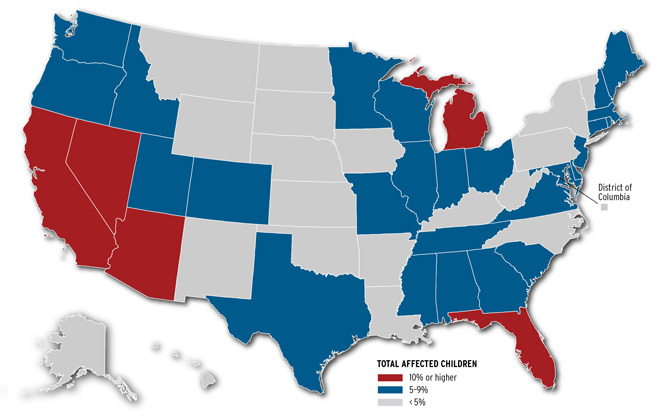 How are children affected by the foreclosure crisis? We have never experienced a foreclosure crisis as bad as this one, so we are still learning. But we do know, from studies dating back to the Great Depression, that when families suffer financial losses, their children suffer. This is partly because families have fewer resources to invest in their children, but also because financial stress affects family interactions. Parents under economic stress sometimes engage in harsh and less supportive parenting, with negative consequences for their children’s social and academic adjustment. In addition, a body of literature finds that children who switch schools, whether because of foreclosure or other reasons, have lower levels of math and reading achievement and are more likely to drop out of school than their more stable peers, even after controlling for poverty and other characteristics. Also, children living in neighborhoods with high concentrations of foreclosure face the detrimental effects of living in a community with more vacant houses, lower social cohesion, and a lower tax base. And these children also face the potential loss of their own home. Unfortunately, the crisis is not over. The 5.3 million estimate of children in owner-occupied homes includes 2.3 million children who have already lost their homes due to foreclosure and an even larger number—3.0 million children—in homes that are already seriously delinquent (by 60 days or more) and at immediate risk of foreclosure. The number of children in rental housing who are affected by foreclosure is also on the rise, at least according to local studies in Baltimore and the District of Columbia. While the foreclosure crisis may have peaked in regions, it is still growing in others. And beneath the surface, as the number of foreclosures continues to rise, so do the risks of adverse consequences for children. I see some of the parents who are dealing with these losses in my family mediation practice. Some of the stories are heart breaking.